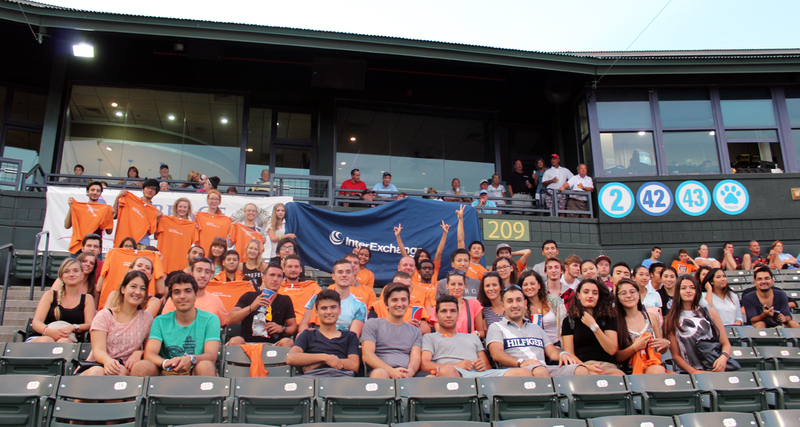 On the evening of August 24, 2015, more than 80 enthusiastic InterExchange students got together to enjoy a Pelicans Baseball game in Myrtle Beach, South Carolina! The picture-perfect summer evening began with the American National Anthem, performed live. Throughout the evening, InterExchange students enjoyed hot dogs, chips, sodas and other traditional ballgame treats. They cheered the team on and participated in mid-inning activities, and one of the students even caught a game ball! InterExchange prepared handouts explaining the rules of baseball for all event attendees as well as lyrics for the song, Take Me Out to the Ballgame. The Myrtle Beach Pelicans are a Class A Advanced Affiliate of the Chicago Cubs. Team mascot names are: Splash, Rally Shark and Deuce. Team colors include pelicans blue, sun gold, midnight blue and white. InterExchange was delighted to have the opportunity to celebrate America's favorite pastime with our international students in Myrtle Beach, South Carolina. A great time was had by all!